Canadian champion lumberjack Stirling Hart can’t remember the first time he strapped on a climbing rope and scaled a tree. It’s not because he’s blocked out the memory or suffered some horrific injury (we’ll get to that big scar on his face later), it’s because he was so young when he started in the family business — grandfather Gordon Hart was a Canadian champion axeman, father Greg Hart was a world champion speed climber — that it was literally before his living memory. Born and raised in Maple Ridge, Hart owned his first axe at age three and was competing in lumberjack competitions against grown men by the age of eight. By his early 20s he held three speed climbing world records. He just turned 26 and still is the record holder in the 90-foot and 100-foot speed climbs, events that involve shimmying up a smooth wooden pole using spiked shoes and a rope belt and then plunging back to earth while tapping the wood every 20 feet or so to slow the descent ever so slightly. 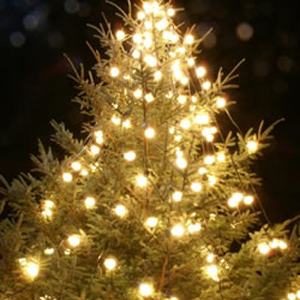 When he set his world record in the 90-foot climb, Hart touched the tree just five times on the way down. Climbers have been clocked at 40 miles per hour on the way down the pole and the landing can do a lot of damage even though there’s a big crash mat at the bottom. “When you hit the ground you still feel it,” said Hart, who has suffered serious injuries to his feet and ankles in the sport. For that reason he shifted his focus away from climbing into the chopping and sawing events that are featured in the Stihl Timbersports series. It was a bold move for a few reasons, the first being that he was walking away from his status as the best speed climber in the world. The key word for Hart, however, was walking. The other eyebrow-raising aspect of Hart’s event switch was his size. He’s a strapping fellow but many of his competitors tower over him at the Timbersports events. No problem though — Hart went out and proved it’s not the size of the lumberjack, it’s how you swing the axe. In his first Timbersports Canadian championships he finished second, and last year he was crowned Canadian Champion, earning a spot on the national team for the World Championships. How did he do it? Hart’s decision to move from climbing to Timbersports to protect his body got an ironic twist five years ago when he suffered his most gruesome injury while wielding an axe. “I know you’re dying to ask,” Hart said with a laugh when he caught me sneaking a glance at the scar on his face during our interview. He was in Australia competing in a springboard event — a supreme lumberjack test that sees competitors slot two springboards into a tree trunk, hopping up to the top where they balance and chop through a block of wood. On that occasion, however, it all went wrong for Hart. The axe luckily missed his eye and his neck but it left a scar that starts about an inch away from his right eye and runs right down to his mouth. It was a dangerous accident but Hart admitted that he now wears it as a lumberjack badge of honour. The injury hasn’t slowed him down at all. The day after we spoke Hart took the stage for the Stihl Timbersports Western Qualifier held at the PNE in front of an appreciative crowd taking in the massive Vancouver Craft Beer Week finale. 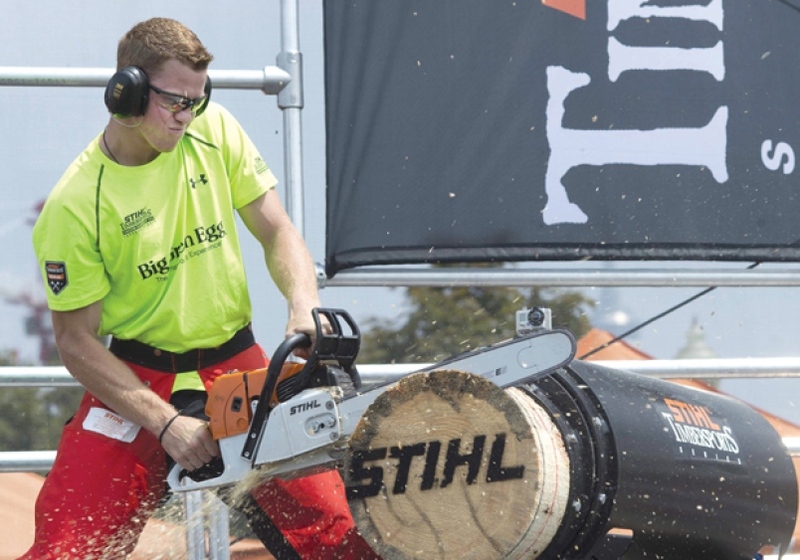 He finished first in the pro competition, earning a berth in the 2015 Stihl Timbersports Canadian Championships scheduled for July 19 in Niagara Falls where he’ll attempt to defend his national title and earn another world championship berth. Lumberjack fans who missed him at the Beer Week event can still catch Hart in action most every day working his summer job as a performer in Grouse Mountain’s Lumberjack Show. He’s been performing three shows a day, seven days a week, six months a year for close to a decade now. 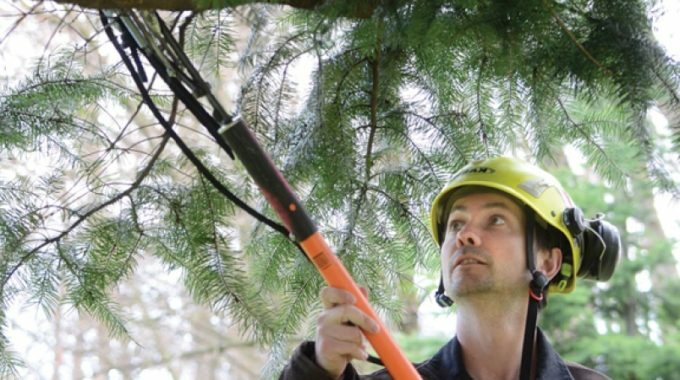 In the winter he keeps himself sharp working as a tree topper for West Vancouver’s Burley Boys Tree Service. It all adds up to enough for him pay the bills, including some expensive, cutting edge equipment. He may not have had any choice in climbing that first tree, and there have been some nicks along the way, but Hart said it’s a dream come true that he’s been able to turn his “glorified hobby” into a career while also proudly carrying on his family’s legacy.